Pyongyang has one of the deepest subway systems in the world. It dives as much as 360 feet (110 meters) beneath the earth. And like many subways in national capitals, there are rumors of secret train lines that stand ready to spirit the country's elite to safety in the event of war or revolt. North Korea applied much of what it learned from the Soviet Union when it comes to protecting the leadership: from secret subway lines, to tunnels that run for miles connecting various palaces and government buildings, and even an alleged one that extends all the way to China! There are special runways, helipads, and train stations that allow the Kims to travel their country in luxury and safety (and without having to wait in line for hours like the average peasant). These "No. 1" train stations are well known and easily identifiable, and even the special runways can be found with little effort (including the new ones that keep popping up), but it can be difficult to find tunnels via satellite. It's even more difficult to verify the rumors about secret underground escape routes. There is an arc of natural hills that lie north of downtown Pyongyang, and each of them is covered with military bases, intelligence buildings, artillery sites, etc., but one of them is special. Located next to the Ministry of Armed Forces District, a hardened, partially underground heliport reveals itself. Its exact coordinates are 39.0633°, 125.7336°, and since I haven't seen any (ANY) information about it, I thought it would be a good idea to share what I know. It's within a mile of four known metro stations, adjacent to the West Pyongyang Train Station, and near a main arterial highway. You can use all three modes of transportation to rapidly go from Pyongyang's secured government quarter to the Military District. And if there are secret tunnel connections, Kim Jong-un could make the trip without fear of being blown up. It's also only 4 miles (6.4 km) away from the newly modernized elite heliport which is used by Kim and the regime's top dogs, and 10 miles (16 km) south of Pyongyang Int'l Airport (which doubles as the home of North Korea's version of Air Force One). This secret "get out" heliport is not directly connected to the Military District above ground. In fact, a multilayered fence divides the two areas, however, a tunnel exits near a villa that goes into the hill and could theoretically connect the two areas, which are less than 500 meters apart. Google Earth/DigitalGlobe image clearly showing the tunnel entrance and villa. Dated May 7, 2013. Based on satellite imagery, the heliport and associated buildings was under construction in June 2000 and was completed by November 2000. Here is a Google Earth image from June 12, 2000 showing the construction process. This one shows the completed work on Nov. 5, 2000. The area surrounding the heliport also underwent drastic changes over a number of years. Below is an image of the area on Nov. 5, 2000. After several years of work, the area had been completely changed. Most of the work was completed by the end of 2006. More recent activity was seen in 2013, when one of the hardened hangars was demolished following what appears to have been a collapse. The apparent collapse occurred at the start of 2013 and the cleanup work seems to have been completed by the end of the year. While helicopters haven't been seen in any public access satellite images, the protective hangar doors have been seen opened in several images. One such time was May 10, 2016. In September 2016, what looks to be the scorch marks from a fire or explosion can be seen on the left landing pad. On the Google Earth image dated Aug. 27, 2016, an unidentified object or mound of material can be seen on the landing pad. By the Sept. 23 image, a large blackened area can be seen, indicative of a fire or explosion. While I don't know if the object/mound in the first image is actually related to the explosion, the fact it was there soon before is worth mentioning. The burnt area hasn't been repaired as of April 22, 2017. Trying to figure out where Kim Jong-un could go without knowing what kind of helicopters are available here is a bit of a guessing game, but if we assume they're one of the known helicopter types North Korea has (such as the Mi-8 Hip, or Mi-2 Hoplite), he could easily reach 270-300 miles (434-482 km) before needing to refuel. That range places nearly every other airport, palace, and key military base in North Korea within reach. It would also enable an emergency flight to China. What exactly goes on at this site or where Kim Jong-un could ultimately end up if he had to flee, can only be a matter of speculation (for now), but it's obvious the regime has taken great steps over the years toward protecting itself. 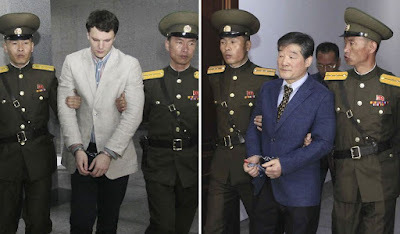 Otto Warmbier (left) and Kim Dong Chul (right), both are Americans who have been detained. Since 1999 there have been 16 US citizens detained by North Korea. Of those, 9 have been Korean-Americans, and all but one have been detained since 2009 - the same year the Six-Party Talks broke down. At least three were Christian missionaries and a further two were associated with Pyongyang University of Science and Technology (PUST), which was founded by evangelical Christians. The most recent detainees are Kim Sang-duk (arrested on April 21, 2017) and Kim Hak-song (arrested on May 7, 2017). 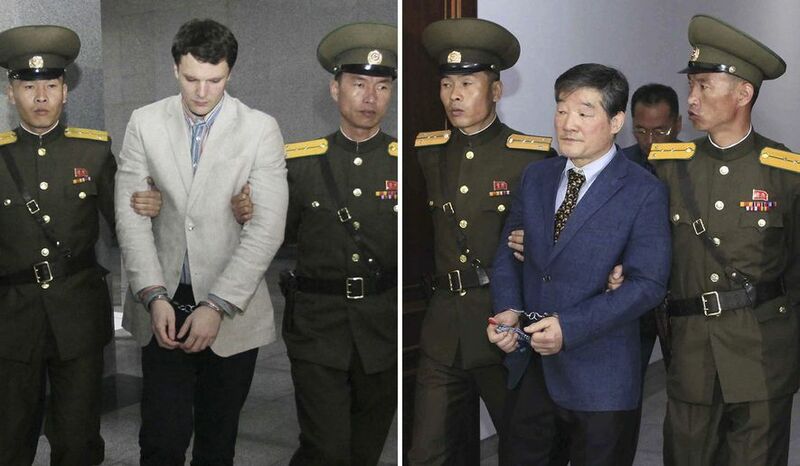 Their arrests mean that there were four Americans being held in North Korea at the same time (until June 13, 2017). The other two are Otto Warmbier (released on June 13, 2017) and Kim Dong Chul. This is the second time that there have been four detained Americans at once. In a minority of cases, those arrested committed what would be considered an actual crime by the rest of the world. One such case is that of Otto Warmbier, who tried to steal a propaganda sign. However, I doubt many would think his 15-year prison sentence is acceptable. In most cases, there doesn't seem to have been any internationally acknowledged crimes that were committed. Since the United States doesn't have diplomatic relations with North Korea, American's can't travel there directly and so must go through either China or another country first. And because the US State Department doesn't have the ability to track who visits the DPRK, there are no firm numbers on how many Americans make the expensive trip to the "Hermit Kingdom". It is estimated that 3,000-4,000 Westerners visit each year and that a few hundred of those are Americans. This makes a person's overall risk of being arrested fairly low, but it's definitely is a risk. It's important to note that Americans aren't the only nationality to be targeted, but outside of the kidnappings of South Koreans and Japanese over the decades, Americans make up the bulk of persons being detained post-1953. Outside of legitimate crimes, the reasoning behind North Korea's actions isn't exactly known. Having high-ranking American officials (current and former) involved in the release of detainees helps to confer some level of legitimacy on the North Korean regime. The actions can also be seen as a "safe" way to exercise some manner of strength against the United States, and it provides a domestic propaganda win - "our country is strong and we won't let the imperialist Americans harm our 'supreme dignity' ". For those who do end up behind bars, the experience is nightmarish. In May, Pyongyang said it had a right to "ruthlessly punish" the Americans it detains, and stories of hard labor, malnourishment, beatings, and lack of proper healthcare are common to many who have been behind bars. However, their treatment doesn't appear to be as bad as those sent to "total control" camps within North Korea's expansive gulag system. It's logical to conclude that keeping Americans alive is more beneficial to the regime than the lives of thousands of North Koreans the government allows to languish to death each year. Here's some additional information about the history of US citizens who have been held by North Korea. The following years saw more than one American detained: 2009 (3), 2010 (2), 2014 (3), 2015 (2), and 2017 (2). As mentioned, 2009 was the year diplomatic talks to halt their nuclear program broke down, 2014 saw a series of medium-range ballistic missile launches, and 2017 has also seen a number of various missile launches as well as preparations for another nuclear test. The two main "target" demographics are Korean-Americans and Christians. Korean-Americans are easy to label as spies, and it's easy to charge Christians with trying to overthrow the regime (after all, God is the only King, and Kim Jong-un can be the only god). The shortest period of detention was the 'catch and release' of Sandra Sun, which all occurred on April 8, 2015. She was charged with "harming the dignity of the supreme leadership, trying to use religion to destroy the North Korean system", but was released the same day. The longest time was the two years Kenneth Bae served in North Korean prison (Nov. 3, 2012- Nov. 8, 2015). Bae, a Korean-American and a missionary was charged with illegal religious activities. Five Americans were charged with illegally entering the country, while six were charged with either espionage, "hostile acts", or crimes against the state.